The following are the acceptable file formats. All other file formats will not be accepted and rejected. Please submit the correct type of files, so we do not have to encounter any delays in the production of your artwork. What guidelines should I follow before submitting my files? * Please save your files in CMYK mode. * Do not submit any files with fonts. All text must converted to outlines before artwork is submitted. * All files should be flattened before submission. * All files should be created at 100% at 300 dpi or 600dpi. Large format banners should be created at 100% at 150 dpi. 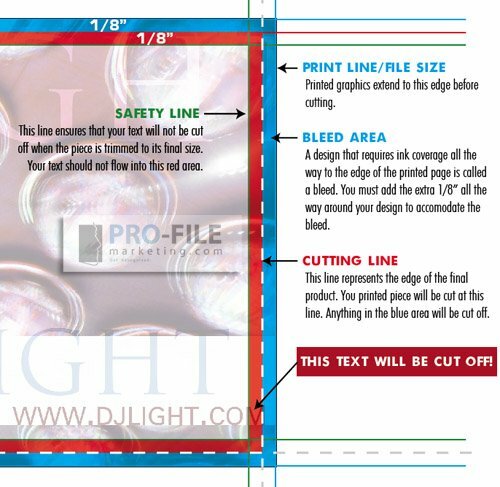 * Please include bleeds in your files for all products printed on paper (add 0.125″ to both width and length of a file). See below for more information about bleed. * If there are no bleeds to the edge of your work, we still need that space to be defined as a white bleed. Please export your artwork with an appropriately sized border with no fill or outline, if necessary. * For Spot Printing (does not apply for full color orders): Please provide us with your PMS color matches for all pertinent color matches. * Anti-aliazing must be turned on when you export to .tiff. This will make your text look smooth, avoiding jaggy artifacts. * Large format photo mural panel layouts should be created as one file rather than separating out each panel into its own individual file. Q: What is bleed and how should I setup my files? A: When any image or element on a page (business card, postcard, letterhead, envelope, etc.) touches the edge of the page, extending beyond the trim edge, leaving no margin it is said to bleed. It may bleed or extend off one or more sides. Photos, rules, clip art, and decorative text elements can bleed off the page. – Postcard file size: 5.125″ x 7.125″ (final size: 5″ x 7″).